NEW ORLEANS – The 2017 NCAA Division II Cross Country Champions can add some more hardware to their trophy case. Tiffin’s James Ngandu and Alaska Anchorage’s Caroline Kurgat both earned the NCAA Division II Male and Female Scholar Athlete of the Year honors, announced the U.S. Track & Field and Cross Country Coaches Association (USTFCCCA). A total of 675 athletes – 393 women and 282 men – earned individual All-Academic honors, with a whopping 89 posting a perfect 4.0 grade point average. The individual All-Academic honor was awarded to those athletes who have compiled a cumulative grade point average of at least 3.25 and finished among the top 30 percent of eligible runners at his or her regional championships and/or the top half of the field at the NCAA Championships. Ngandu picked up the victory at Southern Indiana last fall with a time of 30:18.8 with a pace of 4:53, winning by a convincing 34 seconds. He becomes the first athlete – male or female – from Tiffin to capture the NCAA Division II Scholar Athlete of the Year for cross country. The product out of Nairobi, Kenya, was undefeated on the cross country campaign, posting victories at the NCAA Division II Midwest Region Championships, the GLIAC Championship and three regular-season meets, including the Disney Cross Country Classic. Kurgat was just as dominate as Ngandu this past year. The senior from Eldoret, Kenya, picked up a national title on the course with a finish of 20:32.3 that put her just under 20 seconds ahead of her nearest competitor. Throughout the season, Kurgat won four of her five meets in which she competed, including the NCAA Division II West Region Championships and the GNAC Cross Country Championships. She was also the top NCAA Division II finisher at the San Francisco Invitational, placing fifth behind four runners from NCAA Division I runner-up San Francisco. 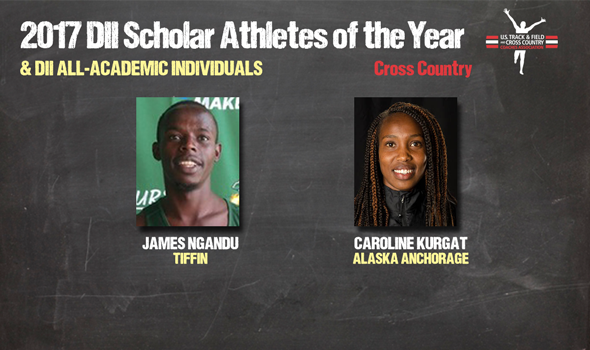 Kurgat is the first female winner of the NCAA Division II Scholar Athlete of the Year for cross country from Alaska Anchorage, joining 2012 men’s winner Micah Chelimo. The full list of student-athletes honored by the USTFCCCA can be found below.